Why Didn't Walmart Put Blockchain in This Cart That Measures How Tense and Sweaty You Are? 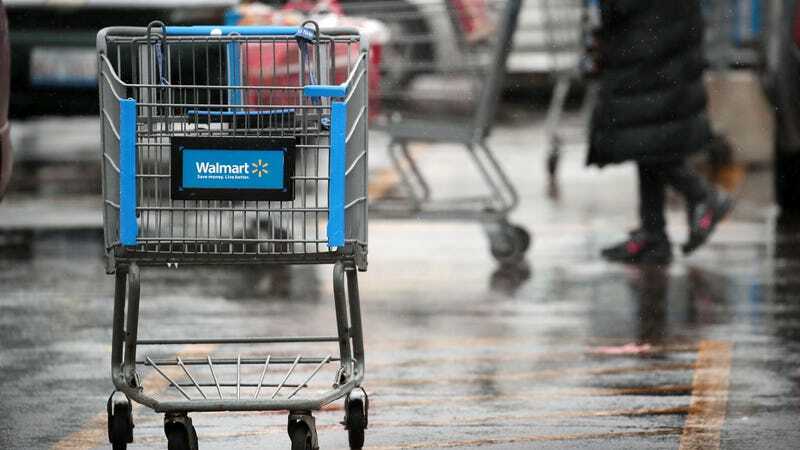 If there’s anything Walmart shoppers needed, it is shopping carts that spy on you. And those shoppers are in luck: Per Vice, the retail giant has filed a patent for shopping carts that could potentially host a range of sensors that would track shoppers throughout the store. According to the patent, which is titled “System And Method For A Biometric Feedback Cart Handle,” the carts could feature sensors capable of monitoring a shopper’s heart rate, temperature, “force being applied to the shopping cart handle,” and current cart-pushing speed, as well as track the weight of the items stored in the carts and their locations in a store. As Vice noted, the patent also mentions the possibility of including a “pulse oximeter,” a device for non-invasively measuring oxygen saturation in a person’s bloodstream. In other words, it’s a cart that attempts to measure how tense, sweaty, and exhausted you are while pushing it, and then potentially stores it in a database along with measurements of other people who are tense, sweaty, and exhausted in Walmart stores. It is not my idea, but I am taking credit for it. “What?” You would ask, before I cut you off. By now, you would be uninterested in social niceties and seeking to escape this conversation by any means possible. But prior to this, I would also have sunk a disastrous amount of so-called “fiat currency” into CartChain’s initial coin offering, a barely regulated form of investment vehicle in which I would have received BitWalCart “tokens” in exchange for several months’ worth of rent. So I would have little incentive to let you, and would have potentially arranged a barricade of carts preventing you from leaving the store. 1. Execute a quick-win financial opportunity by harnessing the power of my proprietary CartChain technology to enable logistics, data analysis, and security at scale. 3. I disappear off the face of the planet while Walmart posts on Reddit asking if anyone knows where I am, which they will not. Thank you. Walmart: If any details of my presentation were unclear, please see the 50 emails I will send you over the next week.